One custom-made platinum floral basket brooch. 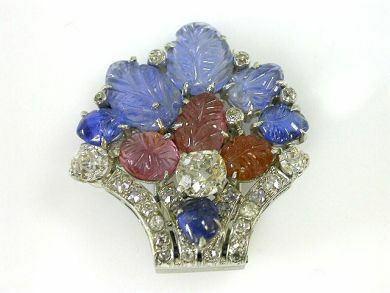 Six carved leaf blue sapphires (2.25 carats). Three rubies (1.45 carats). Twenty-five old European cut diamonds (1.38 carats: SI clarity: H-I colour). One old European cut diamond (0.63 carats: SI clarity: G-H colour).